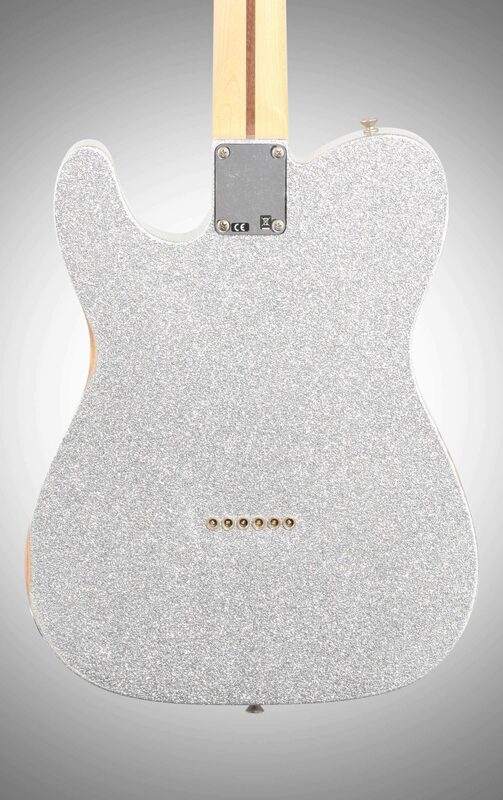 An acclaimed superstar of modern country music, Brad Paisley has defined a guitar-centric sound infused with the voice and vibe of the Telecaster(R). 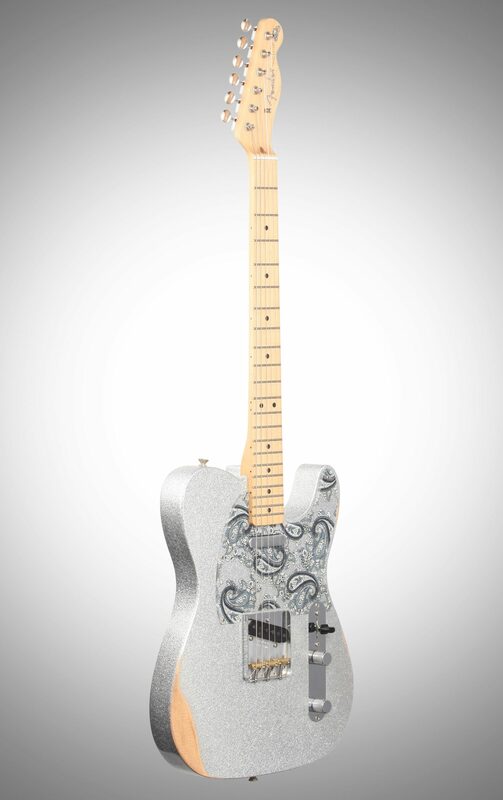 We've teamed up with this award-winning guitarist to create his signature model, the limited-edition Brad Paisley Road Worn Telecaster. An eye-catching instrument with plenty of country mojo, this stage-tested Telecaster is ideal for adding some Nashville flair to your arsenal. The Brad Paisley Telecaster is crafted from a paulownia core capped by a spruce top, providing a solid, lightweight foundation with acoustic-like resonance. 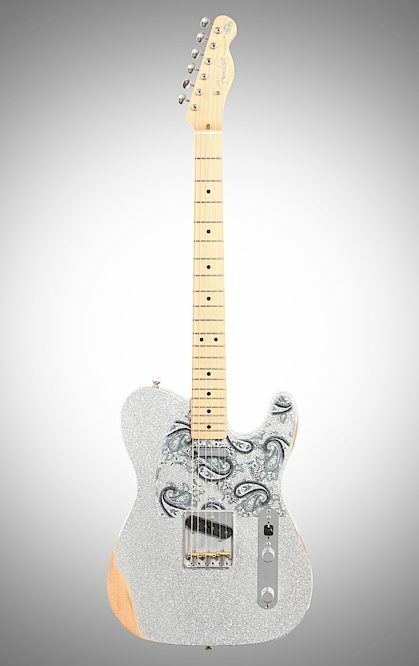 The Paisley-approved pickup configuration includes a custom-wound '64 Tele bridge pickup and a Fender Custom Shop Twisted Tele(R) neck pickup for classic tone with just the right balance of warmth and twang. 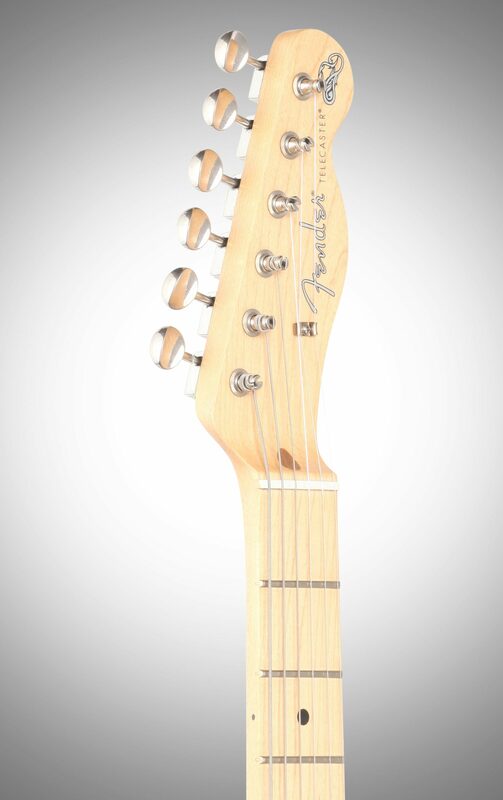 Playability is key to Paisley's fleet-fingered style and the "Enhanced V" neck profile is designed for comfort, filling the hand at the nut for easy chording while flattening out in the upper registers for soloing. The modern 9.5" radius fingerboard and medium-jumbo frets make it easy to play fast and bend big. 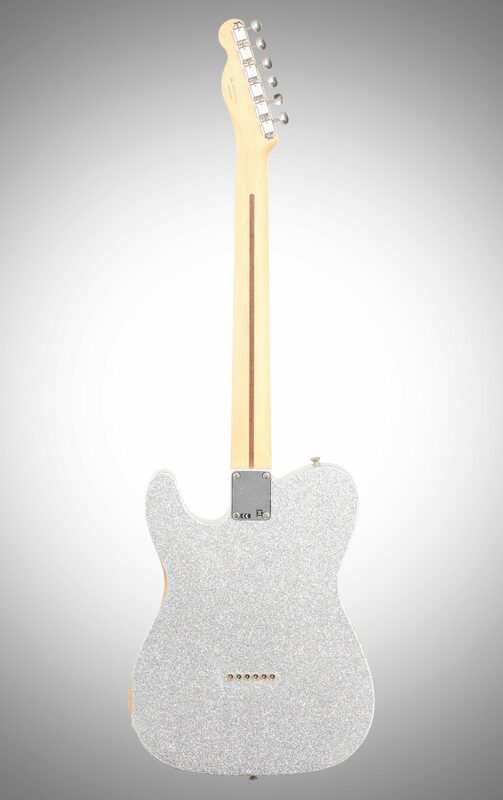 This Tele wears a silver sparkle Road Worn lacquer finish and aged hardware, inspired by many years on the touring trail. 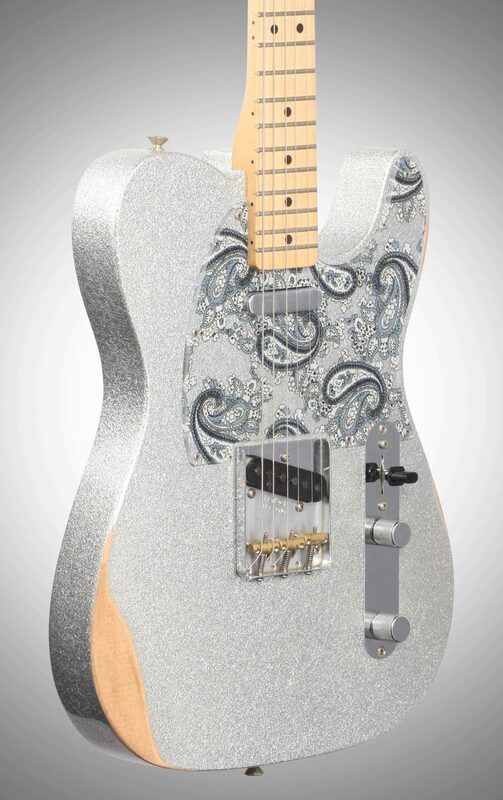 Elegant signature touches include a custom clear pickguard with black and silver paisleys and a cowboy hat insignia on the headstock. Simply put, this easy-playing music machine is a must for Tele lovers and belongs center-stage in any country collection. 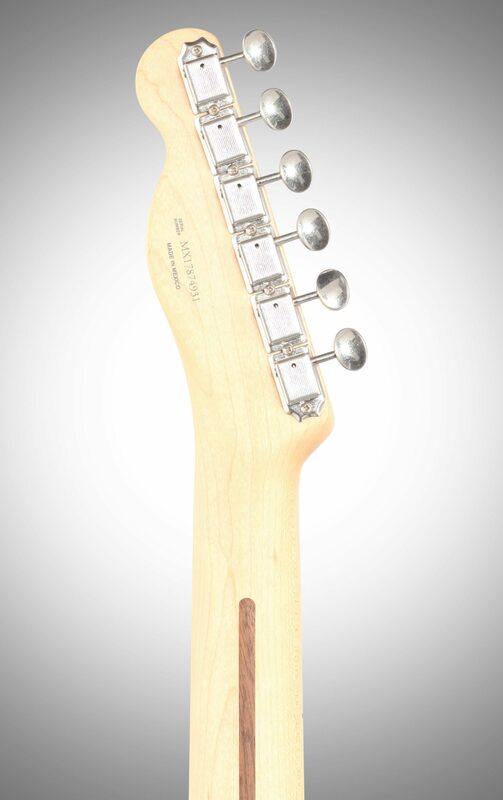 - Neck: Maple, Enhanced "V"
"Well thought out and unique"
Overall: I am very familiar with Telecasters and already owned a CS Nocaster which I love. 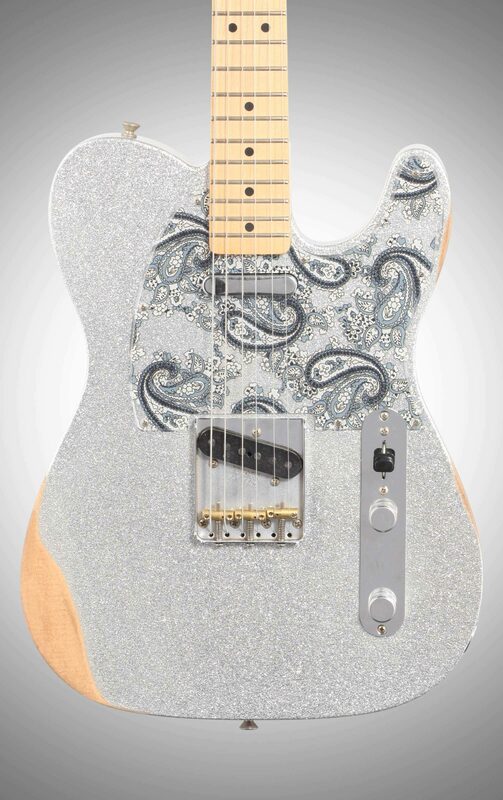 I researched this Paisley and the videos sparked my interest because of the body wood and the pickups. I am a Brad Paisley fan. When it arrived, I plugged it in and was disappointed at first. It played fairly well and was set up the way one would expect it to be, but not to my expectations. String height was almost perfect, a liitle too much bend in the neck. The iIntonation was way off. When I removed the pickguard to adjust the truss rod and the neck pickup (which was way too low), I found that the nut on the truss rod seemed to absolutely too loose as if no one had bothered to intonate. Wanting to retain the resonance of the body, I did not tighten the rod as much as I usually do. I immediately changed the strings to a higher quality set of .46-.10's nickel wound. The action on the guitar was very "slack" and the string needed to be "pulled" way too much to achive a one step bend up. Not good....not acceptable. The string barrels need to be moved toward the neck a lot to get the intonation correct, and thankfully, this decreased the "play" on each string so I did not need to bend the B or E strings2/3 's of the way across the fretboard. After achieving a set-up that I could live with, I put the guitar through it's paces. I was extremely pleased with the balanced blend of both pickups and the neck pickup was perfect for blues. bridge pickup performed like the 1960's Telly's I remember,; not as raw as my favorite Nocaster neck pickup with the steel baseplate, but hot enough to make it interesting. Backing off the volume and using the neck or both pickups and doing some fingerpicking, the acoustic quality of the Paisley Telecaster Spruce and Paulonia body wood really shines through. You can really hear that spruce resonance they talk about in the advertising hype. This guitar is a "keeper". The only thing is, the sparkle paint job is plug ugly. Oh, well...... I love it! "Had to have one "
Overall: I'm a weekend guitarist and have been for 40 years. Also a Brad Paisley fan since I grew up and still live in WV. I have a few other tele's and like them all, but had to have this one when I first heard it was being released. I bought it from zZounds and wanted to be on of the first to have one. I'm glad I did. Lightweight, comfortable to play...chunky neck, and the pickups sound great. Not too hot...but have a nice airy tone to them. I either play through a smaller fender tube amp or a Vox and works well with either one. I would recommend this guitar....reasonably priced and overall a great instrument. Its quickly becoming my go to guitar. Style of Music: rock, country, blues. Contemporary Christian.